Years after the problem was first codified in books such as Silos, Politics and Turf Wars, companies still struggle to solve the riddle of departmental collaboration. Companies are faced with drains of money, time and resources as infighting is often the only thing accomplished. 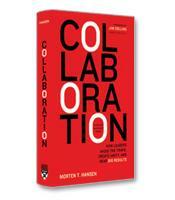 Hansen's book provides a disciplined practice that resulted from 15 years of detailed research. The strength of his philosophy is something about which even the most divided teams would have to agree.